"I didn't like staying at this hotel and don't recommend it.2018-10-02"
"Cheap hotel. The room was pretty clean, but needed a make-over.2016-07-25"
"The hotel was nothing special, and the security level was low. The front desk clerk was nice.2016-07-14"
"Right off I-90. The hotel was clean, pet-friendly, and close to everything. Had both smoking and non-smoking rooms. Barking dogs woke me up. Get up early and enjoy the breakfast bar from 6-9 AM. I enjoyed my stay and would come back.2016-07-07"
"Good rates. We heard a lot of slamming doors and children making noise in the hallway. The Internet wasn't working, which was a big disappointment. The hotel staff was friendly. Breakfast was all carbs. 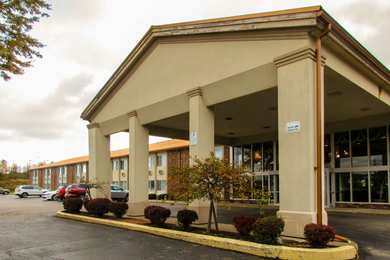 I'd stay here again.2016-05-16"
Learn more about Erie Hotels & Motels in our Erie Hotels Guide.